One of the capabilities that kept me going in difficult times is my intuition, which I usually refer to as my inner sense of knowing. It helps me find the answers that are grounded in my self. In this way, I’m able to discover new perspectives and feel more confident in making decisions. I don’t know how I would have managed without it! I think my inner knowing was always with me, but not fostered in my environment. It wasn’t until adulthood that my intuition and I reconnected when I took an energy psychology workshop. It was teaching a method of releasing emotions stuck in the energy field. Muscle testing was used to help us identify them so they could be released. 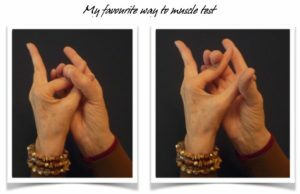 Muscle testing is a means of communicating with the subconscious through our bodies. It was exactly what I needed to make my long-ignored intuition visible. After a few years, I became aware that I knew the answer inside me before the muscle testing showed it. These days, I use muscle testing when working with clients so they can see what’s happening. Otherwise, I go with the inner sense which, for me, feels like the answer landing squarely on my heart (yes) or rolling off to the left (no). Intuition doesn’t live in the world of right and wrong. It’s associated with the right-brain world of subtle connections. You find it through feeling, imagining, and sensing. Intuition communicates with us in various ways. In the beginning, I didn’t understand that and I was frustrated. People around me were able to close their eyes and see pictures as if they were watching a movie. That didn’t happen for me, no matter how hard I tried! I felt so inadequate…until I learned that there are several ways our inner knowing expresses itself. Those people who see images—they are clairvoyant, literally “clear seeing.” Others of us might be clairsentient (feelings/emotions), clairaudient (hearing), clairsomatic (body signals) or claircognitive (thoughts). Befriending your intuition takes an element of trust in yourself—trust that the wiser part of you wants to communicate and will not lead you astray. Check in with yourself and ask, “What feels true for me, authentically, right now?” This will help you distinguish between when you are in your head and when you are connected to your intuition..
You can play with this further if the distinction isn’t clear. Let’s say you have a question, maybe about finding a new place to live. You’ve narrowed it down to a couple ideas but just can’t get a fix on the best decision. Check: What does my head say? Then: Drop your awareness down into your heart and take a couple of deep breaths. Say, filling in the blank: My heart says_______________. Repeat this several times until you have the sense you’ve got right down to your heart’s fundamental answer. Pay attention to how it feels to access information in each of these ways. Can you feel the difference? People often find a sense of expansiveness, rightness, or confidence when receiving heart information. But your way may be something else. That’s okay. There is no right or wrong way. The point is to discover your unique means of communicating with yourself. When you have that heart connection, you’ve tapped into your intuition. Author and teacher Caroline Myss says that you’ll know when you get an intuitive hit because it’s clear and unemotional. For me, it’s something that just is; I know it is true. Since we all have different ways of finding our inner “yes,” it might take some experimentation to find yours. Try various methods to see what seems comfortable and reliable, and trust that you have that place within you that will give you the “yes” when you connect with it. I’ve noticed that some people do better by skipping muscle testing and going to a more internal method right away. Here are some of those approaches to consider. 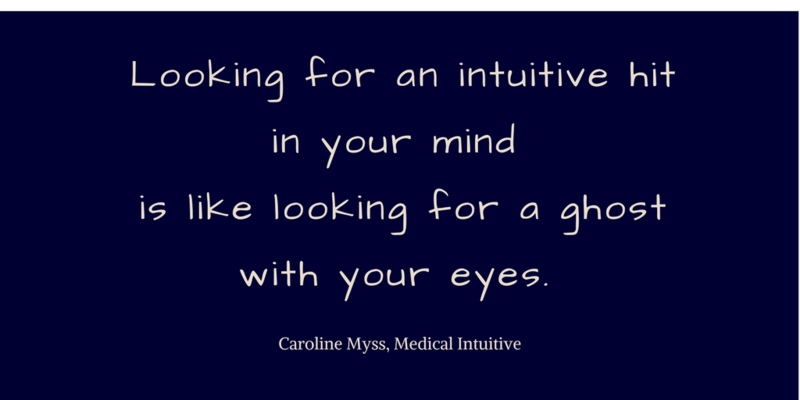 Caroline Myss is a bestselling author and internationally renowned speaker in the fields of human consciousness, spirituality and mysticism, health, energy medicine, and the science of medical intuition. How to Understand the Creative Power of Your Intuitive Nature is a video of her opening address at a 2015 workshop at Castle Combe in southern England. You can find more of her presentations on her free media page. Myss has worked with Norm Sheely, MD for over thirty years. Together they teach an online course in medical intuition: you don’t need to be a practitioner to benefit from learning this. It’s a life skill. Dr. Christiane Northrup is a best-selling author and leading authority in the field of women’s health and wellness, which includes the unity of mind, body, emotions, and spirit. In this video she talks about petitions, which she learned from Robert Fritchie of the World Service Institute. Whatever way works for you, I hope you’re inspired to befriend your intuition. It’s a crucial resource in these times. This entry was posted in Befriending Yourself, Psychology, Energy & Cultivating Self-Authority, All Posts—newest first and tagged muscle testing, inner knowing, Gregg braden, Caroline Myss, Dr. Christiane Northrup, intuition, petition, Robert Fritche, World service Institute by Laurana Rayne. Bookmark the permalink.